Ice shelves are large, thick floating extensions of glaciers that have extended from the land. They have long encircled the Antarctic continent, but are now vulnerable because of warming air temperatures and ocean waters, which can cause them to thin or collapse. When they do, the ice behind them is freed to flow more quickly into the ocean, raising sea levels. The edge of A-68, the iceberg that detached from the Larsen C ice shelf in July. NASA scientists have captured close-up images of a behemoth iceberg that in July detached from one of the largest floating ice shelves in Antarctica. The iceberg is one of the largest in recorded history to split off from Antarctica, and is close to the size of Delaware, consisting of almost four times as much ice as the melting ice sheet of Greenland loses in a year. 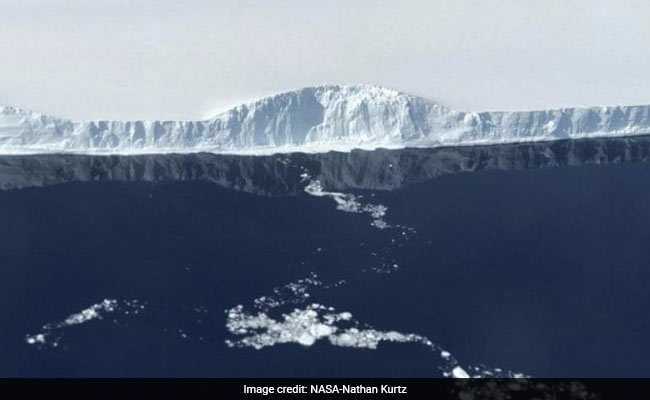 "I was shocked, because we flew over the iceberg itself and it looks like it's still part of the ice shelf, in terms of how large it is and the surface texture," said Nathan Kurtz, a scientist with the NASA-led initiative Operation Icebridge, which traveled to Antarctica near the end of October to get a closer look at the iceberg. "To see it fully detached, to see this massive block of ice floating out there, was pretty shocking," he said. Satellite images in July first showed the 2,200-square-mile iceberg calving and floating away from the Larsen C ice shelf. Scientists had been anticipating that the iceberg, known as A-68, would break from the larger ice shelf, and in recent months watched the progress of a crack extending more than 100 miles long. Operation Icebridge scientists will collect data through the end of the month to track changes in Antarctica's ice coverage, so that they can better understand how the ice shelves and the ocean interact and what effect those interactions may have on climate change. For example, Kurtz said scientists are measuring how much ice is melting from the Larsen C ice shelf both above and below the water to try to predict how the iceberg might behave in the future. The instruments scientists are using include radar sounders that measure the thickness and layering of snow and ice and an infrared camera that measures surface temperature. The iceberg is enormous - one of the most massive ever seen from Antarctica. It's volume is twice that of Lake Erie, scientists said, and it contains so much mass that if all of it were added anew to the ocean, the iceberg would drive almost 3 millimeters of global sea level rise. But the detachment of the iceberg will not affect global sea level on its own, since the ice that has detached was already afloat in the ocean. Kurtz said the detachment does, however, put the destabilization of the larger Larsen C ice shelf into question. "If an ice shelf collapses, the consequences would be a faster rate of sea level rise," Kurtz said. "Because the ice shelf is helping to hold the ice on the Antarctic peninsula back, (the ice) is going to flow out faster." The iceberg's progress will be difficult to predict, Adrian Luckman, the lead MIDAS researcher and an Antarctic scientist at Swansea University, told The Washington Post in July. It could remain in one piece but is more likely to break into fragments. Some of the ice could remain in the area for decades, while other parts may drift north into warmer waters. The change is large enough that it will trigger a redrawing of the Antarctic coastline, Ted Scambos, senior research scientist with the National Snow and Ice Data Center, told The Post in July. The Larsen C ice shelf, previously the fourth-largest of its kind in Antarctica, is now probably only the fifth- or sixth-largest, he said. Larger icebergs have broken off Antarctica in the past, however, including an iceberg of over 4,000 square miles in 2000. Almost twice the size of this iceberg, it broke off the Ross Ice Shelf, Antarctica's largest floating ice body. It was the biggest iceberg ever recorded. The Larsen C ice shelf lost a bigger piece in 1986, Scambos said, but that occurred under different circumstances. The shelf had grown considerably and extended much farther into he Weddell Sea than it does now. This detachment is different, he said, because the ice shelf is now much smaller. There is a debate over whether the detachment of the iceberg can be attributed in any way to climate change. Scientists don't have all the data that they would need to show what is happening in the environment of the floating Larsen C ice shelf, which is affected not only by air temperatures above it but also ocean temperatures below it. Antarctica's ice shelves do calve large pieces regularly. But at the same time, Larsen C is the next ice shelf in line in a southward progression that has previously seen the collapse of the Larsen A and Larsen B ice shelves, making this occurrence at least suspicious. Eric Rignot, a NASA and University of California-Irvine researcher, told The Post in July that he is convinced of a climate role. "For me, there is no doubt that this event is not part of a natural cycle," he said by email. "The Larsen C ice shelf will not collapse for another few decades, most likely, but this calving is unique in the history of the ice shelf since first seen by human eyes by the Norwegian explorer Carl Anton Larsen in 1893."